Beautifully engraved certificate from the Republic Aviation Corporation issued in 1943. This historic document was printed by the Hamilton Banknote Company and has an ornate border around it. This item has the printed signatures of the Company’s President ( W. Wallace Kellett ) and Secretary ( T. Davis ) and is over 60 years old. This is the first time we have had this certificate for sale. 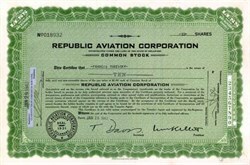 Republic Aviation was established in 1939 when the board of directors of Seversky Aircraft booted Alexander de Seversky as company president because of mounting losses. The company's name was changed to Republic Aviation. W. Wallace Kellett became the new company president. W. Wallace Kellett was also President of the Kellett Aircraft Corporation which had established itself as a leading developer of rotorcraft for the U.S. military. Planes produced by the company included the AP-4, an adaptation of the P-35, the first modern fighter. They were delivered in September 1940 as Republic P-43 Lancers. By 1941, new air combat technology had overtaken the Lancer’s technology, and Republic’s chief designer, Russian émigré Alexander Kartveli, began planning what would turn into the P-47 Thunderbolt. But since the engine that would power the P-47, Pratt & Whitney R-2800 Double Wasp, was not yet available, the U.S. Army Air Corps (USAAC) ordered some almost 2,000 P-43 Lancers to be used in the meantime. Another 108 went to the Chinese Air Force through the Lend-Lease program. None of the U.S. P-43s saw combat duty but served in a training, and later in a photoreconnaissance, role. The P-47 Thunderbolt is ranked as one of the three best fighters of World War II. The plane entered production in early 1942, and early in 1943 began service with Britain’s Royal Air Force as escorts to the B-17 and B-24 bombers. The P-47s could also carry bombs, which turned the fighters into fighter-bombers with the P-47D "Juggernaut," the first large-scale production model. Republic produced 12,602 P-47Ds, the largest number of a single sub-type of any fighter in history. Total P-47D production was 15,660. Production of the P-47 ended in November 1945. The new postwar P-84/F-84 jet fighter-bomber returned Republic to profitability. The company built three main varieties of this plane to replace the P-47. In 1951, Republic began to develop a supersonic fighter-bomber to replace the F-84F. The F-105 Thunderchief, also nicknamed "Thud" (some say with affection and others say because the plane was too heavy), made its first flight on October 22, 1955, although the first production version, the F-105B, was not delivered until May 1958. Republic established a helicopter division in December 1957 and built the French Alouette helicopter. They also made the turboprop airliner—the Rainbow—for short to medium-distance routes. Republic acquired a minority interest in the Dutch aircraft firm Fokker and attempted to market an attack plane in 1960. The aerospace company Fairchild acquired Republic in July 1965. In September, Republic became the Republic Aviation Division of Fairchild Hiller.